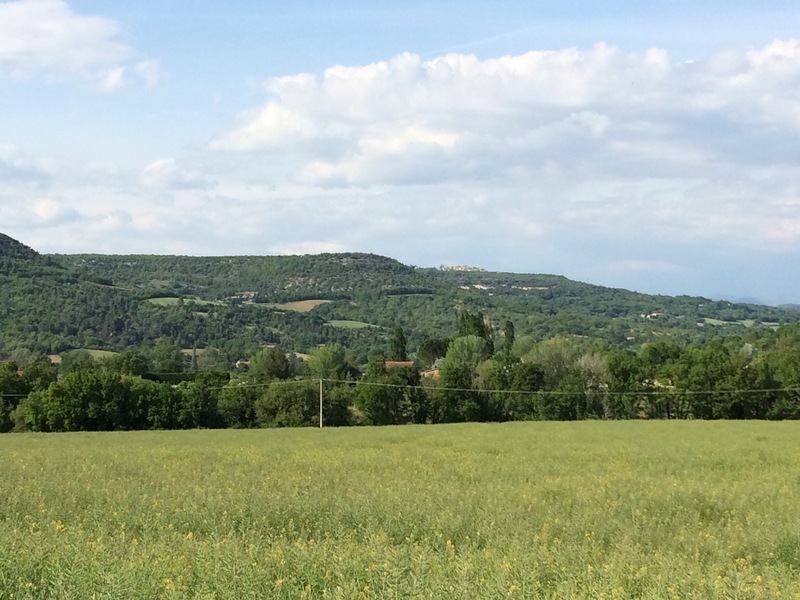 The Veloroute du Calavon is a great off-road cycle path that runs the length of the petit-Luberon from near Cavaillon to beyond Apt. Built on the bed of an old railway track it offers a well-maintained, vehicle-free, flat route through some of the most picturesque scenery in the area. It is a great way to potter through the valley and there are easy routes off that take you (albeit up some hills) to the most well-known villages in the area. 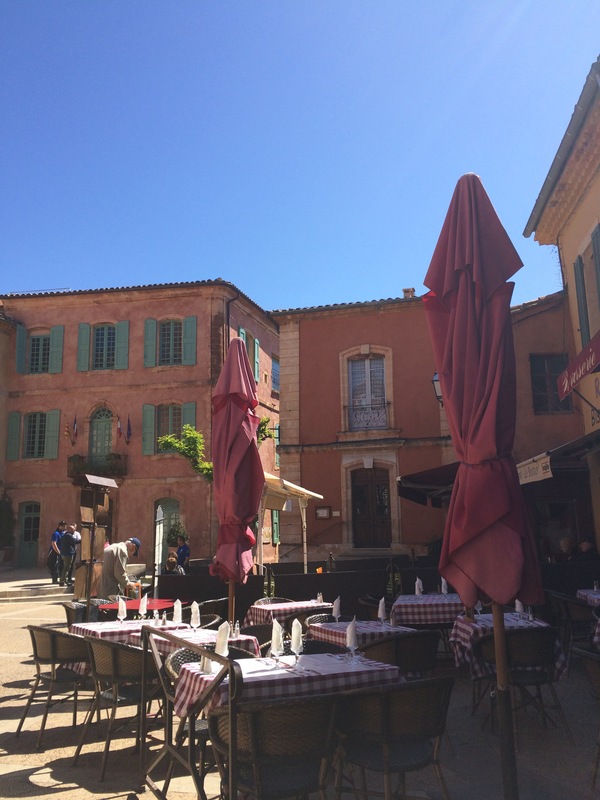 Roussillon isn’t far from the cycle route & it’s easier to arrive by bike in the summer! 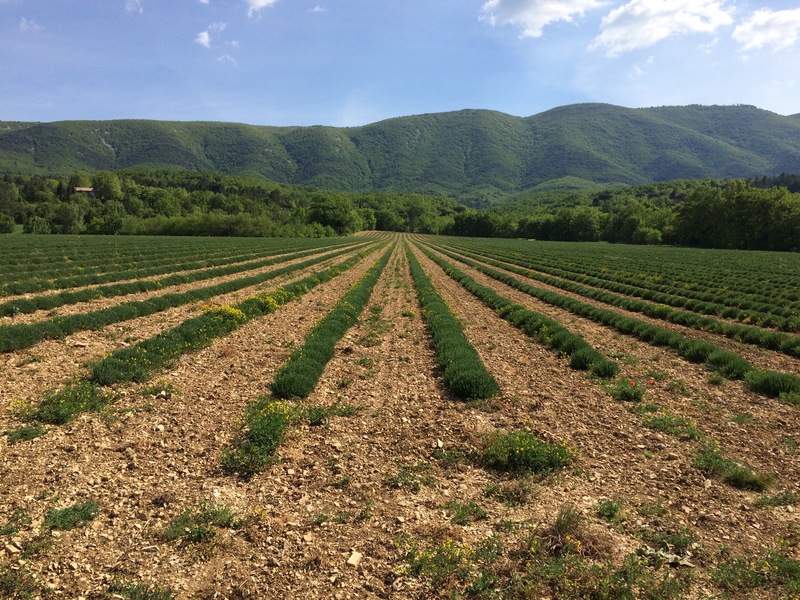 Until now we haven’t really ventured beyond Apt, even though the cycle route continues for some kilometres towards the Departmental border with The Alpes de Haute Provence. So yesterday, after spending an hour drinking coffee, eating strawberries & generally setting the world to rights with our new neighbours (my French is coming on at rate of knots) – I thought I’d take a quick cycle out to see where I got to. From Apt the route takes you alongside the main road towards Forcalquier and the scenery changes almost immediately from the wide valley on the western side of Apt to a much tighter valley with the Grand Luberon rising with its distinctive folds of green to the South and the scrub oak covered flank of the hills that are home to the pretty villages of Caseneuve, Saint Martin de Castillon and Viens to the North. The cycle path continues to follow the route of the river Calavon, crossing it at times until it reaches an end close to Le Begude. 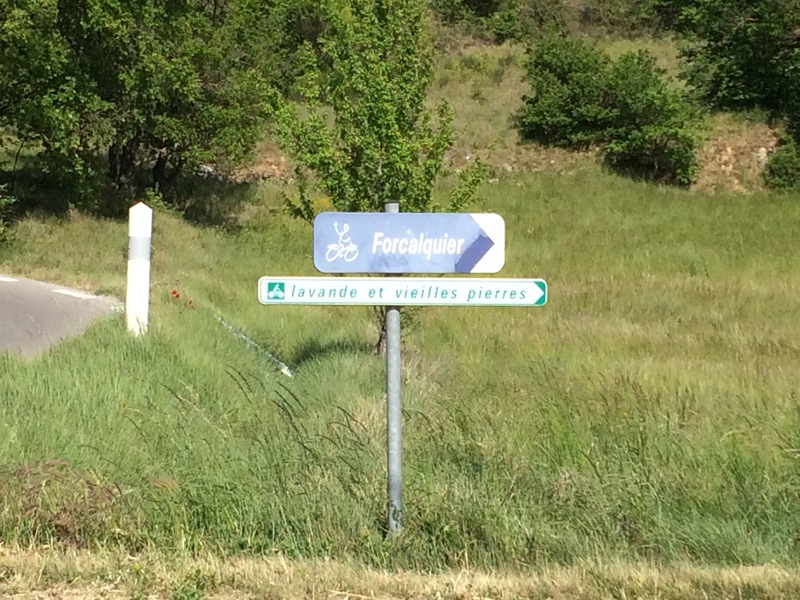 From here though there are a number of beautiful rides and I just kept following the ‘Round Luberon’ cycle route signs towards Forcalquier, just to see where I ended up. follow the blue signs with white arrows on the way oit & you can’t go wrong! 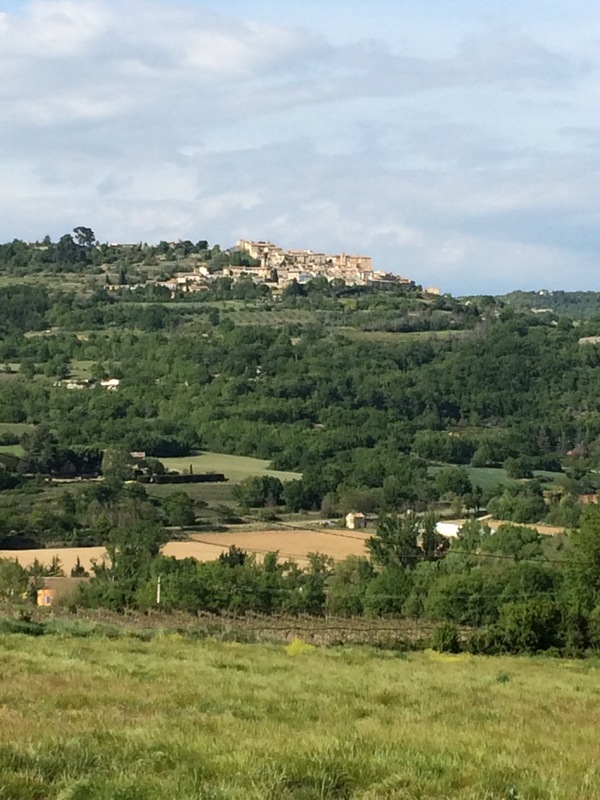 This ‘Round Luberon’ route continues to take you on back-roads, through beautiful scenery on a very well-marked route. There really isn’t any need for a map as every junction is clearly marked with a distinctive sign, even on some sharp bends in the road! 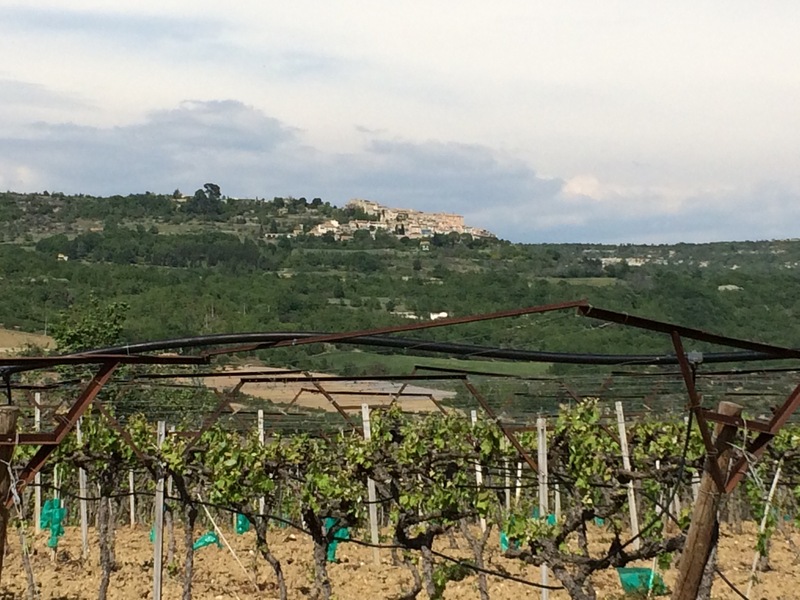 The roads undulate gently, although there was quite a stiff head-wind on the way out so at times it was quite hard work, but the environment was beautiful with new growth on vines starting to show…. And the glimpses of hill villages…..
After a few miles the trail almost meets the main road, but a cycle path has been cut in to allow you to cycle from one back road to another without having to deal with the traffic. 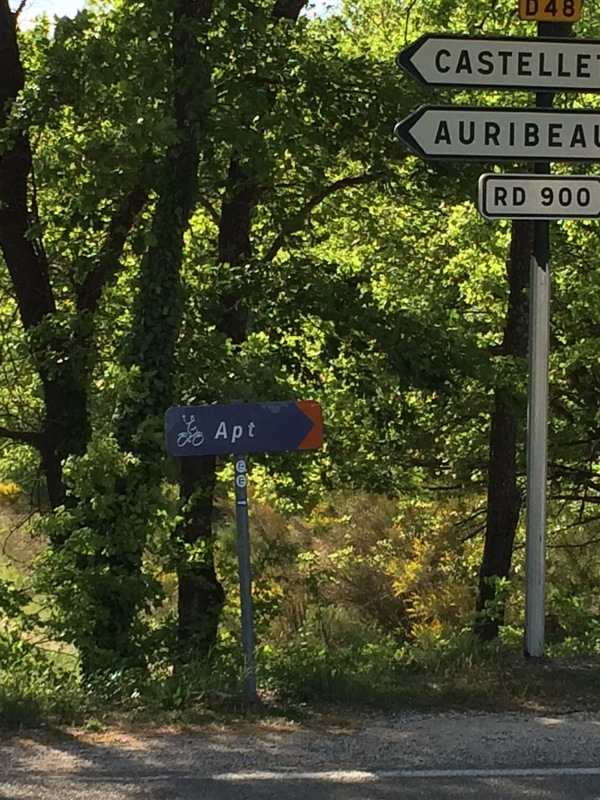 At this point the ‘Round Luberon’ signs are also joined by another cycle sign for the ‘Lavande et veilles pierres’ route, which takes you away from the main road, on a gentle climb before dropping down into the small town of Cereste. 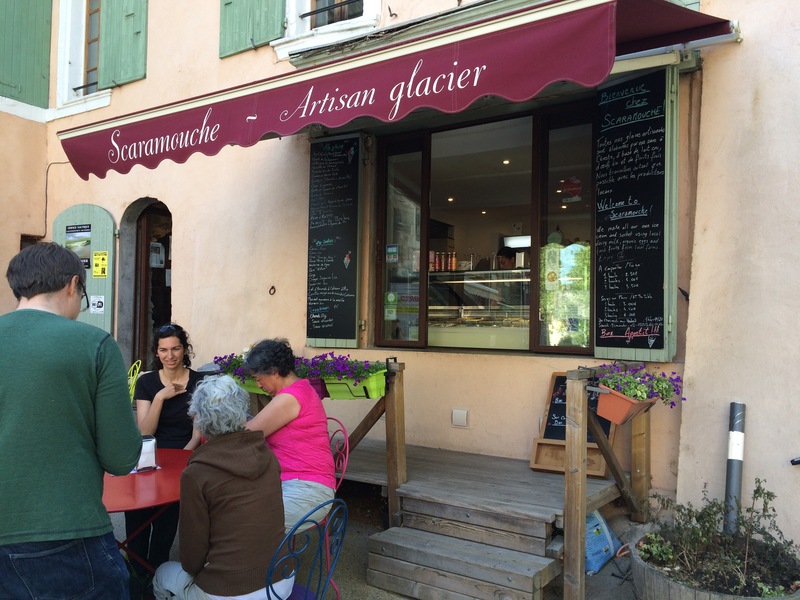 Now if there’s one thing I know about Cereste that is that it has a superb ice cream shop – in fact it is currently rated as the 3rd best in France & deservedly so. Scaramouche, http://www.glaces-scaramouche.com/en/quisommesnous_histoire.html which opened just over 2 years ago has some of the most wonderful flavours for ice cream & sorbet I’ve ever seen and it was great to see that all the tables on the pavement in front of the small shop-front were packed with customers. As there were no seats I chose a 2 boule cornet of ‘Lait d’amande et calisson’ and ‘orange sanguine’ and sat in the sun on a wall in the square – next time I might choose one with herbs! The fact that it is a relatively short cycle from our house means that I can see myself testing most (if not all) of the flavours this summer – at least the cycle there & back should just about account for the calories I’ll be consuming! Happily having cycled into the wind on the way out I had it in my back on the way home & seemed to cover the distance in half the time, feeling as if I was flying up the gentle hills without any effort at all! just follow the orange arrows on the way back – simple!! 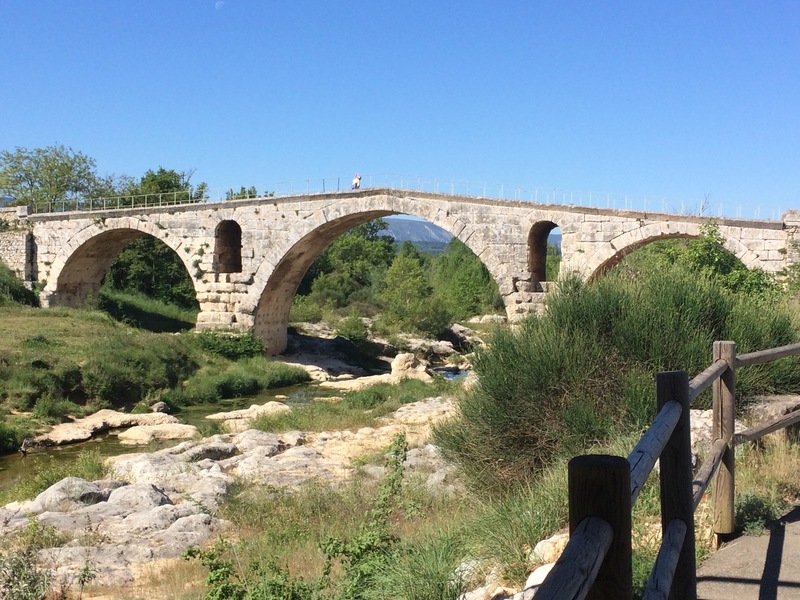 So there is some wonderful cycling to be had beyond the end of the Veloroute, along quiet roads through stunning scenery and there are certainly more routes yet to discover ! Previous Post Bargain hunting at the tip! I love the sound of the lavender and old stone cycle route. 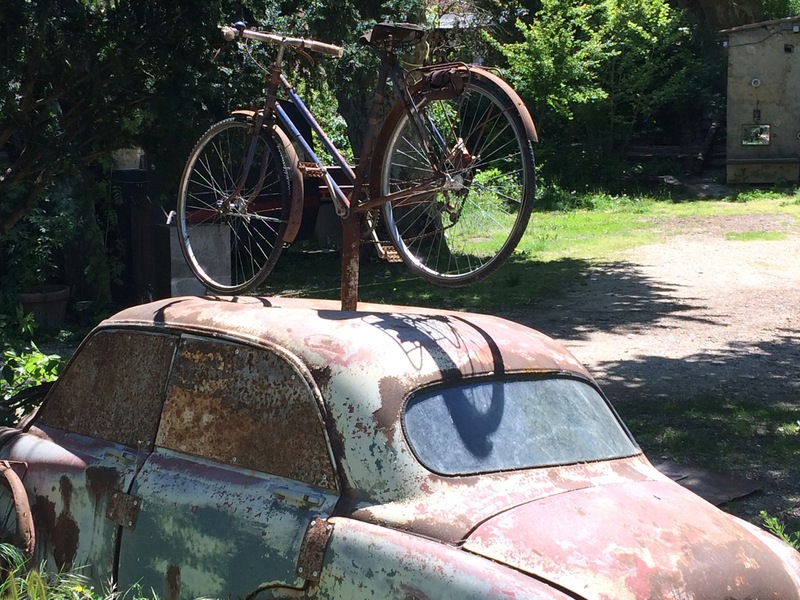 Next time we are in the area we will have to bring our bikes (normally we are on holiday in the Mini Cooper). Imagine that ride when the lavender is in full bloom, perfection at each pedal turn! Have you read Lunch in Paris or Picnic in Provence by Elizabeth Bard? Scaramouche is hers, I believe. Fantastic information. I hope to do this next time we are in Provence. With pleasure !! Any preference for the next tasting? Will see what I can do ! 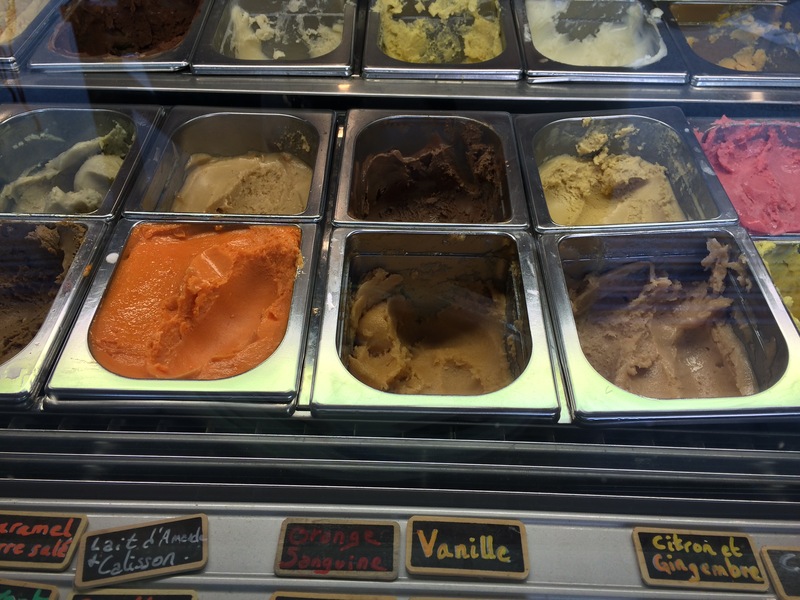 One of my first purchases here was an icecream maker – so far strawberry & banana in the freezer!